"Not buying new stuff because soon enough I have to pack my life into a suitcase and come back home" thing is not going so well. How can you say no when you receive an invitation to Proenza Schouler sample sale where's everything is up to 85% off retail prices (love you, new york!). Even though most of the stuff was still out of my budget, I yet managed to get three great items for less than $200, including the patterned top in the picture. 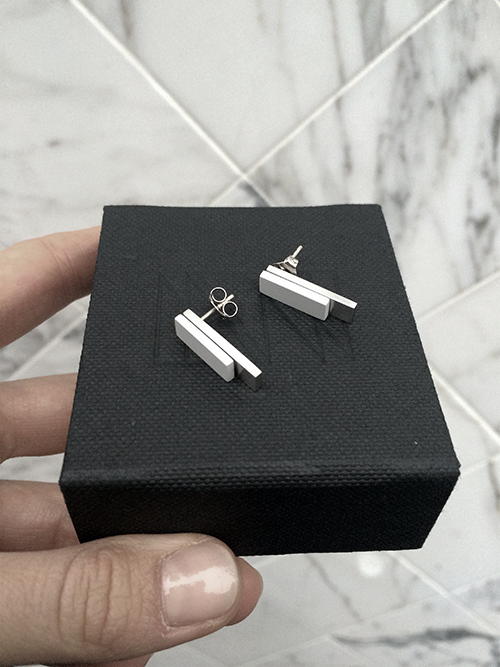 Most importantly, I am wearing my new lovely earrings by a NY-based brand Ming Yu Wang. I had a pleasure working for the designer a couple of weeks ago and I absolutely fell in love with her very simple and refined jewelry. Can't wait to show you the look book we shot in a beautiful location outside the town. You are so beautiful! You're my big inspiration! I love these kind of minimalism which u represent.